Good. 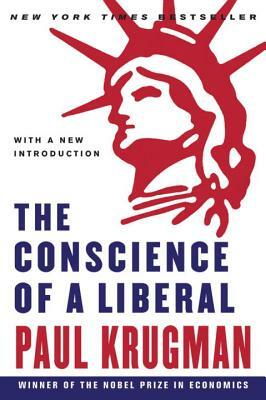 The Conscience of a Liberal by Krugman, Paul. Trade paperback (US). Glued binding. 352 p.
Very Good. This wholly original new work by the best-selling author of The Great Unraveling challenges America to reclaim the values that made it great. Sewn binding. Paper over boards. With dust jacket. 296 p.
Krugman's book is less an auto-biographical account of how he came to hold certain liberal views and much more a brilliant short essay on the nature of economics and its anthropogenic basis. In short, our current economic system did not fall out of a tree, full-formed like an apple, but, rather, is the result of human action -- intellectual, political, moral. He simply destroys the notion that there is, apart from society, some pure Newtonian economic realm that we ought not touch. In short, the invisible hand is invisible for a very good reason. It doesn't exist. If there is any hand at work, it is our human hand, and we ignore this ontological fact at great peril to our well being. The important implication of this participatory view of economics is the observation that our middle class life after WWII was not the result of the economy's separate and natural maturation, but, rather, was the result of human intervention during The New Deal, a period he says that is called by economists The Great Compression. We created our middle class by political action and decision during The Great Compression. And it has been by political action and decision that our middle class way of life is being dismantled by neo-liberal forces who have worked very determinedly to create "movement conservatism" to achieve this dismantling, the end of which is to return to the times of McKinley and the Gilded Age. He makes the case that if we do not like what is taking place economically to us in the US, we must organize politically to make the necessary economic changes to restore a healthy middle class. Mere hope is not a method. By now most people know that this author and New York Times columnist , Paul Krugman, has just been awarded a much deserved Nobel Prize in Economics. This book is a must read for anyone interested in gaining an understanding of how America has arrived at our current right wing politics, how the Republicans dismantled FDR?s New Deal, and how the deregulation of the Reagan / Thatcher years brought about the financial mess we now find ourselves in. It appears that the coming election will set American on a new course and if you want to understand how the new administration must chart this course this is a timely read. It is indispensable in comprehending how and why we got here and how to chart a course out. Essential knowledge for anyone who needs to understand the tangled mess and poisonous brew of economics, politics and race. Yes, I said ?race? for I was amazed to discover the role race played in holding back (and later dismantling) New Deal measures while the rest of the industrialized world moved ahead in leaps and bounds with regard to health insurance and social security programs. If, like me, you tremble at the thought of a book on the history of economics rest assured that this slim volume is superbly written in language any high school student can understand. A dry subject is made exciting, approachable, and more important, understandable. It is also available on CD. A must read for anyone who wants to gain a comprehension of our current mess. A superb read! Highly recommended. And, most important, brief. I dare you to try to put it down.